Author's Note: So, I am going to try to get back to basics with my writing, since it seems my ideas have been slowly drifting into the 'way-too-weird'. While I am not abandoning the infinite city, since I have about 100+ pages written for the setting, I am taking a slight break from setting writing. Expect more weird monsters and equipment in the posts to come. 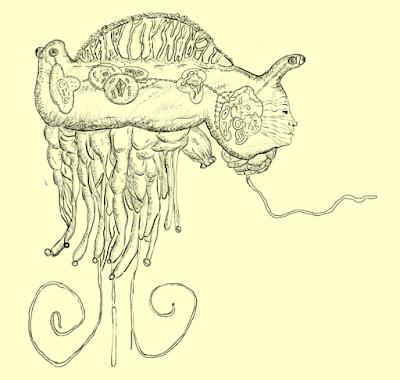 This is the first post in the aforementioned vein of content, the Masquerade Jellyfish (aka face stealing monster). I have included a table for possible origins for these nefarious monsters and the a service they could provide if they are befriended. 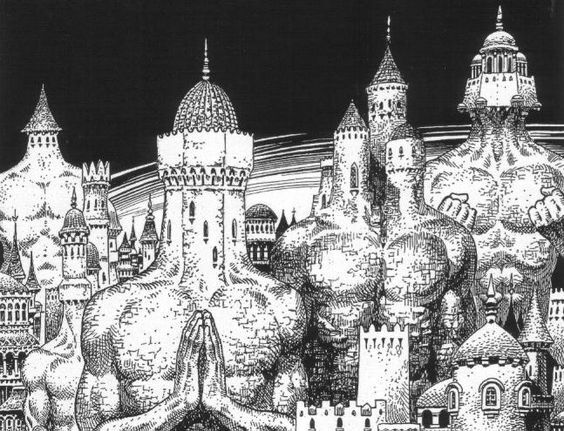 I used the following systems to create the monster: Pathfinder and OSR / LotFP / AD&D. I should have the Pits & Perils version as well as the Into the Odd version up within a few days. While they prefer the briny depths, or humid terrestrial environments, these strange beings can be found in any environment; their capability to fly, and fortify themselves against hostile environments, removes the need for oceanic environments. Minds as alien as their bodies, their reasons for removing and collecting faces can be considered obscure at best. Once they have removed the faces, their motives are rather clear, to impersonate the person whose face they have stole. With their jelly-like bodies, they are capable of pulling their forms into a myriad of shapes, including humanoid ones. Though they can take on any humanoid shape, those shapes are influenced by the shear volume of the creature, meaning that those shapes tend toward “burly” or “curvy”. These Masquerade Jellyfish do have to cover their entire body, outside of the face, due to the fact that while the shape looks humanoid it looks anything but when uncovered. Despite the fact that the body attached to the removed face may have a drastically different physical build from the original owner, the switch will go undetected as long as the strange construction of their bodies is not revealed. It is unknown as to why people automatically assume the imposter is the actual person, despite vast differences in physical appearance and behavior, the 'spell' only being broken when what's under their clothes is revealed. An Experiment Gone Wrong / Right: A cabal of wizards, a god-like being, an unchecked machine intelligence: whatever the case may be, these creatures were purposefully created for a specific purpose. However, their creator(s) are not around to check their machinations and behavior; perhaps their creators even approve of their behavior. Whatever the case may be, they do not possess a 'natural' origin, with their history not going back terribly far. Mind of a Strange God: The species itself is the mind of an incredibly intelligent/wise/enlightened being/god. This being/god's mind is so expansive that it cannot be contained in a single mortal form, rather it can only be fit into the combined minds of an entire species. Whether they know it or not, they are fulfilling the will of this being, who will one day reintegrate its mind which will bring about the end of the Masquerade Jellyfish. If they know about their origin, the Masquerade Jellyfish will most likely develop a religion based around the ascension of the race as a whole at the end of this god's work. Forced / Accidental Evolution: Whether their evolution to their current state was intentional or accidental, these jellyfish started out as simple jellyfish. Through being exposed to a number of unnatural substances/forces, these jellyfish began a rapid evolution (rapid in the biological sense, so anywhere between a few years to a few centuries). Their alien minds and behaviors are a result of sudden changes, meaning they did not develop naturally as adaptations to their environment. Visitors from Another Realm: They are not from this planet/universe/multiverse/plane, explaining their bizarre behavior and mentality. Perhaps they are here for a specific reason, or they ended up here by accident, whatever the case they may be, they're here and up to no good. Political / Economic / Military Manipulation: They seek to impersonate people in high places in order to manipulate a city/state/country/world, what the end goal of these machinations is up to you. Whatever the case may be, their goals can be understood by mortals despite how labyrinthine their methodology may be. Motivations Strange and Incomprehensible: You could never understand why, maybe even they don't understand why. Somewhere out in the wide multiverse someone might know (their god / ultra-evolved leader / advanced machine intelligence), but to we mere mortals it will forever be a mystery. Evolutionary Improvement / Ascension: Perhaps by stealing the faces of individuals allows the jellyfish to integrate the genetic information of the individual, or allows them to go into society in order for them to collect their desired samples. In any case, the goal of their actions is to improve themselves or the species as a whole. Collection of Rare Materials / Subjects: Their theft of faces is only to gain access to certain resources or people/creatures with the least amount of effort/conflict. Whatever the reason is for their collection, its going to be for something big, and will cause drastic changes to the world in general if they succeed. With the focus being on acquisition, they will avoid drawn out social interactions as part of their plans. Aside from their origins and motivations, the jellyfish can be valuable allies if you can convince them that they are better off with your help rather than your face. Not only can they transfer the essential identity of a person to themselves, they can transfer it to another person. 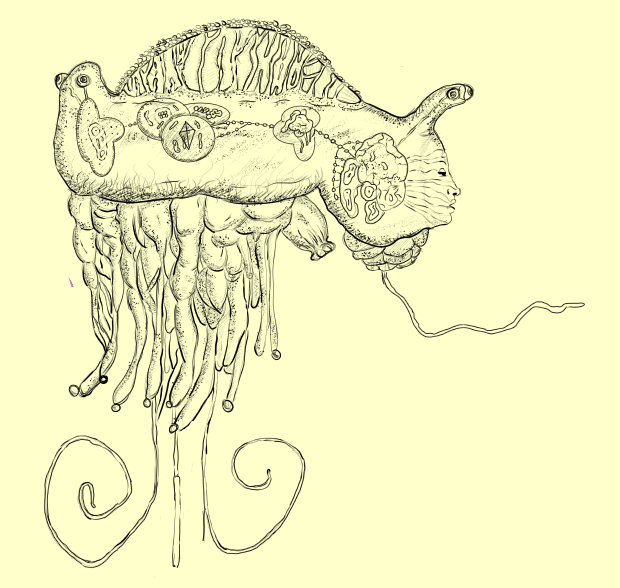 This transfer requires the sacrifice of the original face, which can be safely stored by the jellyfish, requiring another surgery to revert back to the original identity. Transfers between humanoids has the added advantage of the 'spell' not being ended when the individual is seen without a complete clothing coverage. Space: 5 ft.; Reach 10 ft.
Paralyzing Poison (Ex) Tentacles—injury; save Fort DC 16; frequency 1/round for 6 rounds; effect 1d4 Dex; cure 2 consecutive saves. The save DC is Constitution based. Anesthetizing Poison (Ex) Tentacles —injury; save Fort DC 16; frequency 1/round for 6 rounds; effect Staggered Condition; cure 2 consecutive saves. The save DC is Constitution based. If the character does not make their save by the sixth round, the condition persists for the next hour. Shift Form: A single Jellyfish can store up to 8 faces at a time. While stored, the faces are not subject any form of rot or spoilage. As a full round action that provokes an attack of opportunity, a Jellyfish can take on the form of a humanoid and the identity of the worn face. While the face is being worn, people automatically assume the imposter is the actual person, despite vast differences in physical appearance and behavior, the 'spell' only being broken when what's under their clothes is revealed. At the DM's discretion, they may allow a DC 17 Will Save to notice the imposter if they act significantly out of character for the person being impersonated. Remove Face: While in Jellyfish form the monster may remove the face of a Helpless character. If given 3 uninterrupted rounds to 'operate' on a Helpless character, that character has to make a DC 21 Fortitude save or have their face removed. Needless to say, the loss of a face can destroy the life of an individual. Firstly, the character takes a -10 to all diplomacy rolls due to the disfigurement. Secondly, all social encounters for the character start at 1 level worse than they would normally be, because people can be jerks. The only way to get their face back is for a Regeneration spell to be cast on the character. Boon: Face Transplant – The Jellyfish can transfer the face and identity of one person to another. This transfer requires the sacrifice of the original face, which can be safely stored by the jellyfish, requiring another surgery to revert back to the original identity. While the face is being worn, people automatically assume the imposter is the actual person, despite differences in physical appearance and behavior. At the DM's discretion, they may allow a Will Save (DC = ½ HD + Cha Modifier + 10) to notice the imposter if they act significantly out of character for the person being impersonated. Paralyzing Poison —Injury; Save frequency 1/round for 6 rounds; effect 1d4 Dex; cure 2 consecutive saves. Anesthetizing Poison —Injury; Save frequency 1/round for 6 rounds; effect: character may take their normal action once every other round; cure 2 consecutive saves. If the character does not make their save by the sixth round, the condition persists for the next hour. Shift Form: A single Jellyfish can store up to 8 faces at a time. While stored, the faces are not subject any form of rot or spoilage. As a full round action a Jellyfish can take on the form of a humanoid and the identity of the worn face. While the face is being worn, people automatically assume the imposter is the actual person, despite vast differences in physical appearance and behavior, the 'spell' only being broken when what's under their clothes is revealed. At the DM's discretion, they may allow Save versus Spell to notice the imposter if they act significantly out of character for the person being impersonated. Remove Face: While in Jellyfish form the monster may remove the face of a Helpless character. If given 3 uninterrupted rounds to 'operate' on a Helpless character, that character has to make a Save versus Paralyse or have their face removed. Needless to say, the loss of a face can destroy the life of an individual. Firstly, the character takes a -10 to rolls involving social interaction due to the disfigurement. Secondly, all social encounters for the character start at 1 level worse than they would normally be, because people can be jerks. The only way to get their face back is for a Regeneration spell to be cast on the character. 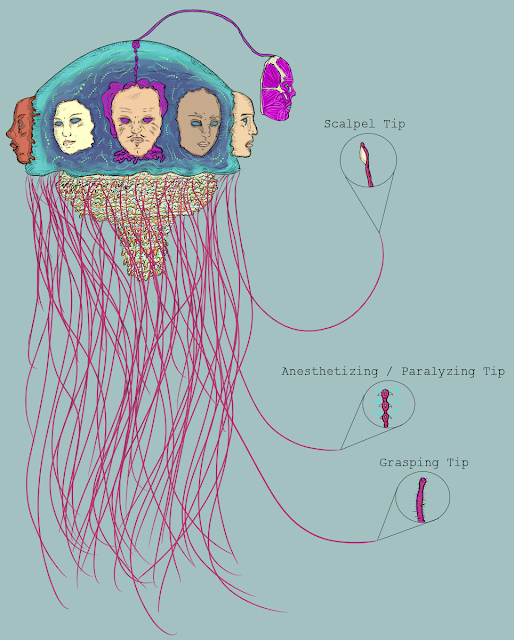 Boon: Face Transplant – The Jellyfish can transfer the face and identity of one person to another. This transfer requires the sacrifice of the original face, which can be safely stored by the jellyfish, requiring another surgery to revert back to the original identity. While the face is being worn, people automatically assume the imposter is the actual person, despite differences in physical appearance and behavior. At the DM's discretion, they may allow a Save versus Spell to notice the imposter if they act significantly out of character for the person being impersonated.